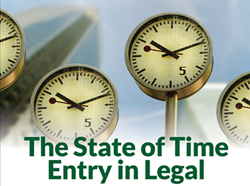 New, first-of-its-kind infographic, depicts the state of time entry in legal from a recent survey focused on time entry in law firms. Bellefield Systems, LLC, the leader in mobile and anywhere time entry solutions for firms of all sizes, announced the release of a new, first-of-its-kind, infographic depicting the state of time entry in legal from a recent survey focused on time entry in law firms. How poor timekeeping practices have resulted in time leakage and decreases in revenue at law firms. The impact of a firm’s time entry policy. Ways to improve revenue through contemporaneous time entry. The “State of Time Entry in Legal” is based on Bellefield’s research, as well as a survey conducted by Legal Vendor Strategies, among firms with 150 plus attorneys, representing almost 100 law firms worldwide. Bellefield is committed to helping lawyers improve their work lives by developing innovative and intuitive applications that solve real-world challenges. Bellefield does this by identifying a problem, evaluating it from many different perspectives, and working tirelessly to create the best possible solution. Bellefield’s flagship product iTimeKeep ranks #1 as the most adopted Mobile Time Entry Solution for attorneys for the third consecutive year. Founded by software veterans Gabriela Isturiz, Daniel Garcia, and John Kuntz, Bellefield is an independent, privately held company headquartered in Pittsburgh, Pennsylvania. To learn more, visit Bellefield Systems. iTimeKeep is a game-changing mobile application that simplifies contemporaneous time entry while eliminating the burdens of complicated and invasive time capture applications. Upon hearing the frustrations of attorneys required to use technology that is counterintuitive to the way they work, Bellefield developed iTimeKeep to give them the ability to easily get the job done anytime and everywhere, increasing adoption and improving internal operations. iTimeKeep is delivered as a Time Entry as a Service (TEaaS) model in order to maximize the benefits of mobility to firms, without taxing on their resources. iTimeKeep was recently ranked by ILTA as the most adopted Mobile Time Entry Solution for attorneys for the third year in a row. To learn more, visit iTimeKeep.